IOI City Mall, a four-storey megamall, is a shopping, lifestyle and entertainment hub with hundreds of shops, indoor ice-skating rink and theme park in Putrajaya. Surrounded by lush greenery and shaded walking paths, the shopping centre also has colourful water fountains and presents a beautiful sunset view. The mall measuring at about 130,064 m2, consists of 350 local and international retail outlets. Luxalon ® interior ceiling system was engineered to create a boat shape which was suspended using standard carriers system. While the baffle been applied as an aesthetic screening and ventilation for M & E services. Hunter Douglas has wide range of ceiling systems from Linear, Wide Panel, Curve, Tiles and special for interior and exterior applications. 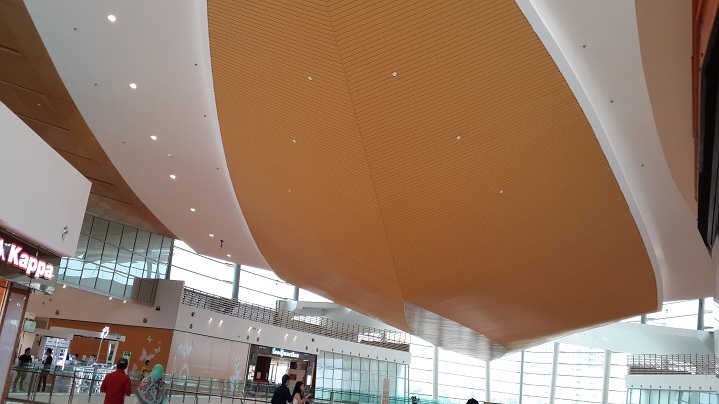 Interior ceilings are specially developed with the same aesthetic appearance as exterior ceilings allowing a wide range of design possibilities.